This site has been developed to fill a perceived need for an up-to-date source of accessible information specifically on Martian meteorites for educators, researchers and collectors. It is intended to be complementary to several other excellent websites, such as the NASA Mars Meteorite Compendium, which is a comprehensive summary of research information on Martian meteorites. A useful summary of all types of meteorites (including Martian examples) can be found on the Northern Arizona University website. One colleague who deserves special mention is Dr. Ted Bunch, who not only has been a valued collaborator in our joint research on Martian meteorites, but who generously provided many of the thin section photomicrographs on the linked individual pages for Martian specimens (to be added soon). Meteorites are objects composed of rock and sometimes metal which are derived from various solar system bodies, and after traveling through space land on the surfaces of other solar system bodies (notably Earth, but also the Moon and Mars, and no doubt other worlds). Most meteorites are not observed to fall, but instead are found long afterwards, and then must be subjected to a variety of forensic tests to ascertain their provenance. It's truly a scientific detective story! Most meteorites are reasonably inferred to come from relatively small bodies (up to several hundred kilometers in diameter, but mostly much smaller) located within the Main Asteroid Belt, which is a collection of more than 100,000 objects larger than 1 km constrained by celestial mechanics to orbit the Sun between Mars and Jupiter. (Contrary to scenes from the movie “Star Wars”, there now are very large distances between each of the asteroids, but they do get hit by other orbiting objects, or are gradually moved into transfer orbits from which they can be perturbed into Earth-crossing trajectories). This diverse collection of asteroids may include primitive objects (that is, early, unprocessed material left over from the accretion or partial accretion of the planets from the solar nebula), but also the disaggregated remains of now destroyed former planetary bodies, some of which had resided much closer to the Sun. There are other known asteroids that do not orbit within the Main Belt (such as various near Earth objects or NEOs), and some of these also could be sources of meteorites. The most prevalent meteorites found on Earth contain small, partly glassy spheres called chondrules, and such rocks are termed chondrites (of at least 14 different types). Other meteorites lacking chondrules are called achondrites, and a subset of those are commonly referred to as planetary meteorites. 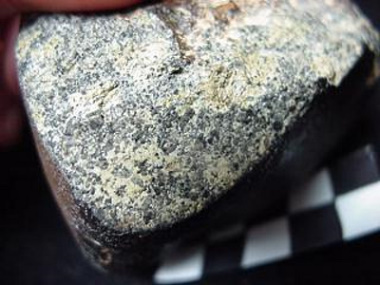 This latter group comprises meteorites that derive from current or former bodies of sufficient size and with enough heat that they became internally layered (or differentiated), with a dense core and an overlying lithosphere (composed of a mantle and sometimes a crust as well). The relatively rare iron meteorites and also the pallasites presumably represent the disaggregated cores of former planetary bodies. How did Martian meteorites get here? Gravitational interactions among all bodies orbiting the Sun cause perturbations that result in collisions between some of them. Early in solar system history such collisions almost certainly were much more frequent and involved much larger masses, so it is not difficult to imagine that some fairly large bodies were destroyed and dispersed in such events. Today, the interactions that ultimately deliver meteorites to us are less energetic, yet still can cause small pieces of a large body struck by a smaller object to be ejected at a rate that exceeds the escape velocity needed to overcome the gravitational force of the larger body. For Mars (with a gravitational acceleration about 0.38 that of Earth) this requires a fairly energetic collision by a small asteroid onto the Martian surface. The material so excavated could consist of rocks outcropping at the surface and/or subsurface samples from a certain depth. In the early 1980s scientists were skeptical that specimens that we now know to come from Mars actually could be accelerated enough to escape Mars gravity. Once the Martian origin of some specimens became undeniable (see below), theorists were forced to reconsider the physics of this process, and discovered that it was indeed possible to eject material by a mechanism called spallation. The fact that all Martian meteorites show evidence of moderate to high shock pressures is very consistent with these conclusions. How do we know they are pieces from Mars? The detective work that eventually connected a small group of strange achondritic meteorites to a fairly well known planet is a remarkable philosophical achievement. Actually, solving this case depended on a relatively unheralded measurement by the two NASA Viking spacecraft that landed on Mars in 1976. Although sent to conduct experiments to detect extant life in Martian soil (which they did not), the Viking landers gained redemption of sorts because the instruments measured the amounts of different gases in the thin Martian atmosphere. Those same gases were first found in 1983 by Donald Bogard and Pratt Johnson in very small amounts (but in the exact same proportions) trapped within shock glass veins and pockets in shergottite Elephant Moraine 79001, and now in at least five other Martian meteorites (see plot). So what about all of the other alleged Martian meteorites? It turns out that all of them have kinship based on several other diagnostic criteria: (1) they all contain iron-rich oxide minerals (magnetite, chromite, ilmenite) and no iron in metallic form, (2) they all contain an iron sulfide mineral called pyrrhotite, instead of troilite (as found typically in iron metal-bearing meteorites), (3) the pyroxene and olivine minerals within them have ratios of Fe (iron) to Mn (manganese) that are distinctive (see plot below), and mostly significantly, (4) they have a narrow range of oxygen isotopic compositions different from those of any other achondritic meteorites (see plot below). Taken together, these forensic measures constitute a preponderance of evidence that all the 133 or so proposed Martian meteorites are from the same body, and the atmospheric gas evidence proves beyond doubt that the body is in fact Mars. Thus, unlike the case for lunar meteorites, we have the curious circumstance of knowing that these specimens come from Mars even though humans have not yet obtained directly any rock samples from there. Even more intriguing is the fact that none of the Martian meteorites (possibly with one exception) seem to be very similar to the rock outcrops at any landing sites explored so far with robotic craft. However, the bulk FeO/MnO ratios for the freshest rocks at Gusev crater are very similar to the bulk FeO/MnO ratios for shergottites, providing another very strong link. In the late 1970s scientists came to realize that three odd groups of achondrites known at that time (three shergottites, three nakhlites and a unique stone called Chassigny) might be genetically related, and a few scientists (notably Lewis Ashwal and Edward Stolper) even dared to hypothesize that all of these may come from Mars. One line of argument was that since these were all igneous rocks containing oxide minerals with iron partly in the ferric form, they must come from a fairly large body capable of internal melting, and furthermore one which is relatively oxidized. The 1976 NASA Viking landers supported the conjecture that the distinctive overall reddish color of Mars was caused by surface dust deposits that strongly resembled mixtures of clay and ferric oxides, like those produced by weathering of terrestrial lavas. 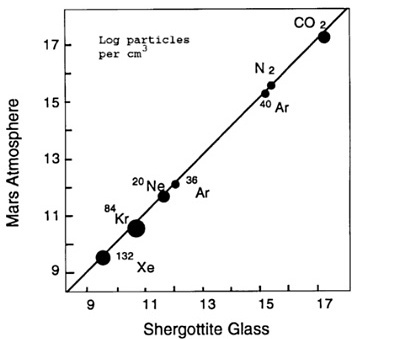 In addition, radiometric dating of several shergottites by Laurence Nyquist and colleagues demonstrated in 1979 that at least part of their parent body had experienced magmatism within the last several hundred million years. As a convenient acronym, these specimens were dubbed the SNC meteorites, but worse was the colloquial use of the term “SNCs” (commonly pronounced in oral presentations as “Snicks”). Some scientists still use this term, but most have abandoned it in favor of the much more direct and simpler term “Martian meteorites”. The discovery of the Antarctic meteorite Allan Hills 84001, which is a unique Martian orthopyroxenite (rather than an S, N or C variety), influenced this change in terminology. Until 1977 there were only six known specimens that were to become recognized as Martian meteorites. Today the number of separate Martian meteorites is about 133, although for some of these there is more than one officially recognized name, because of naturally paired stones or broken pieces of the same original single stone. One remarkable Martian meteorite (Elephant Moraine 79001) has two different lithologies in contact, but is still counted as one specimen here. The actual number of unpaired Martian meteorites is probably slightly less than 133, because it is difficult to decide about pairing relationships among some stones without sophisticated analyses (such as determinations of cosmic ray exposure ages). The specimens which are listed together in single entries on the linked List are judged by the author to be paired based on the best available information, but some of those assignments may be subject to change as additional data are obtained. The largest Martian meteorite is Zagami at 18.0 kg (40 lbs), followed by Yamato 000593 and paired stones at 15.0 kg (33 lbs), Tissint at >12 kg (>26 lbs), Sayh al Uhaymir 005 and paired stones at 11.2 kg (25 lbs), Dar al Gani 476 and paired stones at 10.4 kg (23 lbs), and the numerous stones of Nakhla at 9.9 kg (22 lbs). The smallest unpaired Martian meteorites are Grove Mountains 020090 (7.5 grams), Grove Mountains 99027 (10 grams), Queen Alexandria Range 94201 (12 grams), Northwest Africa 4480 (13 grams) and Lewis Cliff 88516 (13.2 grams). Where are they found? And by whom? Annual expeditions to Antarctica since 1975 by Japanese, USA, and more recently Chinese government-sponsored teams have resulted in a steady increase in the number of Martian specimens. The first Antarctic Martian meteorite (Allan Hills 77005) was found on December 29, 1977, the second one in 1979, and the most recent one (Larkman Nunatak 12095/12240) in January 2012. Additionally, in the late 1990s exploration of the rocky deserts of Northwest Africa and Oman (supported largely by private collectors) led to a dramatic increase in recovered specimens that still has not abated. 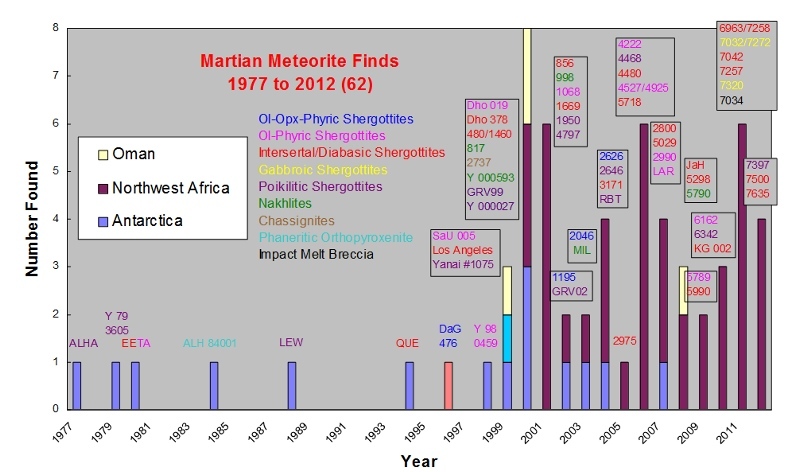 In fact, over half (62%) of all Martian meteorites found since 1975 are from Algeria, Morocco and adjacent regions; one is from Libya and four are from Oman. Video documentation about the discovery of the Ksar Ghilane 002 Martian meteorite in Tunisia is at (weblink). Although most meteorites must fall in the ocean, there can be no doubt that Martian meteorites have fallen on land everywhere, if only we could recognize them in forested or urban areas. There are other rocky deserts (for example, in Australia, Mongolia and the western USA) that would be fruitful places to search. Given the success of nomads in Northwest Africa and others in Oman, it must be concluded that future discoveries elsewhere are limited mainly by insufficient effort. Let's get going! The number of lunar meteorites (presently about 140 - see here) is similar to the number of Martian meteorites, yet not a single lunar meteorite has been witnessed to fall. In contrast, four Martian meteorites (Chassigny, Shergotty, Nakhla and Zagami) were observed striking this planet, and it is remarkable that these represent three of the major subgroups (Shergotty and Zagami are very similar to each other). The stories of the falls of these special meteorites in 1815, 1865, 1911 and 1962 are well documented elsewhere. The fifth witnessed fall of a Martian meteorite occurred in the early hours of July 18, 2011 in a remote rocky desert region southwest of Tissint, Morocco. The meteorite pieces (in total over 12 kilograms) were not found until about 4 months later, but the freshness of both the fusion crust and the interior of numerous broken fragments are quite consistent with the earlier visual and auditory accounts by local observers. The amounts of the short-lived cosmogenic nuclides 54Mn and 22Na detected in a specimen analyzed by Dr. John Duke at the University of Alberta are consistent with a very recent fall date (at least within the last 5 years). The meteorite was named Tissint (pronounced Tee.seent) after the village located about 70 km from the strewnfield. In Berber this name means “salt”, in reference to the saline water and salt deposits in this region on the north side of the Oued Drâa intermittent watershed, which separates Morocco from Algeria. Tissint is a different variety of shergottite from the two previous shergottite falls (Shergotty and Zagami), but similar to a group of 11 other shergottites (termed olivine-phyric) found elsewhere in northern Africa, Oman and Antarctica. The large olivine grains exposed on the exterior of the Tissint meteoroid melted in a distinctive way as it plunged through our atmosphere, as is evident in the picture above. The obverse side of the same piece reveals the pale gray interior with its sporadic pockets of vesicular black glass (formed by shock as the material was ejected from Mars). If Tissint is indeed like the other compositionally-similar olivine-phyric shergottites, then it might be expected to have an igneous formation age near 460 million years ago and may have been ejected (along with the other 11 similar examples) about 1.1 million years ago. *Ejection Age: Drs. Marc Caffee and Kunihiko Nishiizumi have determined the ejection age for two samples of Tissint from measurements of cosmogenic beryllium-10 to be 1.1 Ma. 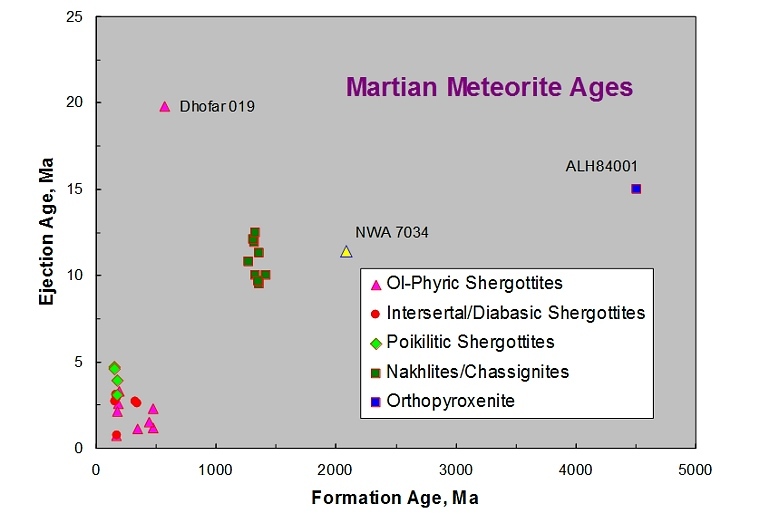 This result fully supports their hypothesis that ALL of the depleted olivine-phyric shergottites (with the notable exception of Dhofar 019) were ejected from Mars together at this time, but landed on Earth at various times over the past 450,000 years (and as remarkable as it seems predominantly in Northwest African countries). Dhofar 019 has the longest space age measured so far for any Martian meteorite (20 million years). *Crystallization Age: Analyses to determine the crystallization age for Tissint using Sr, Nd and Hf isotopes have been undertaken in several laboratories. Dr. Gregory Brennecka, Dr. Lars Borg and Dr. Meenakshi Wadhwa determined a preliminary Sm-Nd isochron age of 596 ± 23 million years. Therica Grosshans, Dr. Thomas Lapen and Dr. Rasmus Andreasen obtained a Sm-Nd mineral isochron age of 616 ± 67 million years and a less precise Lu-Hf mineral isochron age of 583 ± 86 million years. These results indicate that Tissint has a formation near 600 million years ago and is the oldest shergottite dated so far (along with Dhofar 019). 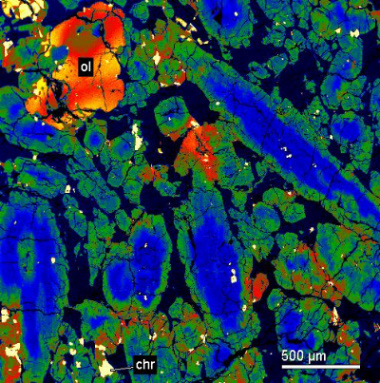 Tissint also has the highest positive bulk hafnium isotopic composition yet measured for a shergottite, which implies that its mantle source region has one of the most depleted lithophile trace element signatures known for Mars. An unusual black, fragmental breccia specimen found as several stones purportedly near Bir Anzarane, southern Morocco in 2012 is the first available specimen of an impact breccia from the Martian crust. A 320 gram specimen was designated as NWA 7034, but additional stones have been found, two of which have been designated as NWA 7475 and NWA 7533. The key noble gas analyses to establish the presence of trapped Martian atmosphere in NWA 7034 were done by Dr. Julia Cartwright, and some other mineral chemical features of this specimen are consistent with those determined for shergottites (but with some surprising differences). Although initially regarded as a product of explosive volcanic activity, it seems more likely that this specimen records impact-triggered melting and mixing on the Martian surface. It is a complex breccia composed of angular mineral grains and dark-colored, spheroidal objects in a very fine grained matrix. Trace element analyses by Dr. Munir Humayun have demonstrated the presence of elevated contents of nickel and platinum-group elements in many components of NWA 7533, suggesting contributions from chondritic impactors. Iron oxides (predominantly magnetite) are unusually abundant, and are best explained as originating in ancient Martian soils (like the red-brown dust covering the planet today). These could have been mixed into the NWA 7034 breccia (along with chondritic siderophile elements) by impact processes. 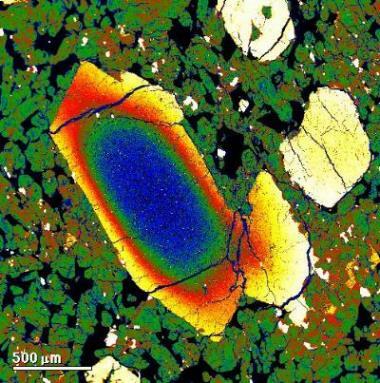 Oxygen isotopes are not uniform among all components of this meteorite. Detailed analyses by Dr. Karen Ziegler have shown that, although the pyroxene grains match shergottites in their oxygen isotopic composition, the feldspars and iron oxides are quite different and must reflect interaction with a different reservoir (probably the Martian atmosphere). This meteorite contains significant amounts of water, presumably at least in part hosted by grains of chlorapatite. 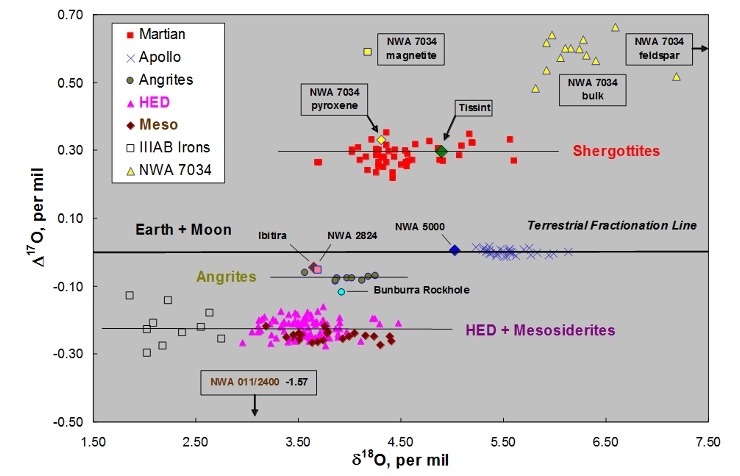 Heating experiments on NWA 7034 by Dr. Francis McCubbin yielded a bulk water content of about 0.3 wt.%, and the oxygen isotopic composition of the liberated water matches that of shergottites (suggesting that it represents water from the Martian mantle). Initial chronology studies suggest an overall age for NWA 7034 of about 2 billion years; however, it is unclear whether this is an igneous age or the age of impact-triggered melting. Abundances of rare earth elements in NWA 7034 clinopyroxenes are most similar to those for augite in nakhlites, and the plagioclase also is somewhat similar in composition to that in nakhlites. The cosmic ray exposure age from analyses of cosmogenic Neon-21 is about 11 million years, which is essentially the same as that found for nakhlites and chassignites. So what are the major deductions to be made so far regarding this specimen (keeping in mind that there is much more research to be done)? 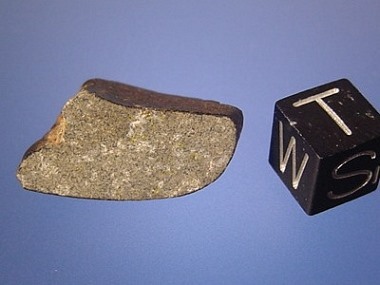 NWA 7034 and paired stones evidently represent a sample from the Amazonian (or older) Martian crust. The petrological and chemical evidence for an origin by impact processes may imply that this material derives from the more heavily-cratered southern hemisphere of Mars. The absence until now of such regolith breccia samples from Mars has been puzzling, given the broad similarity of the southern hemisphere terrain to that of the lunar highlands. 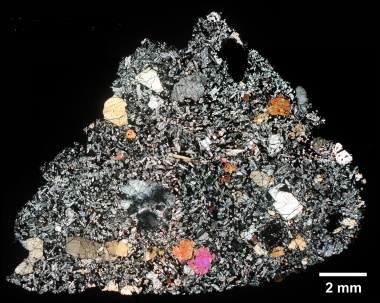 The connection (if any) to the 1.3 billion year old nakhlites and chassignites has yet to be established, but there is no doubt that NWA 7034 has the potential to reveal new secrets about ancient Martian igneous, weathering and impact processes. Some people think that Martian meteorites should be red in color, or perhaps green. In fact none are truly red or even brown (except for parts of some that have been weathered after they landed on Earth). Some Martian meteorites really are dark green (the nakhlites) and a few have pale greenish parts (some ultramafic shergottites), but most are gray or khaki-gray in color, and others are brown or even black (as a result of shock darkening). I sometimes ask students as an extra credit question on exams: “What color are the rocks on Mars?” Even though during lectures I show images of obviously gray outcrops at the Pathfinder or Spirit landing sites (some partly covered with reddish dust), inevitably many students answer that the rocks are red! Whole shergottite stone Northwest Africa 4468. Large crystals of orthopyroxene are visible through the black fusion crust. Mars Pathfinder landing site in Ares Vallis. Note the gray rocks covered by red-brown dust. 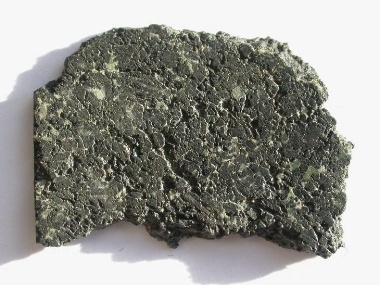 A lot of metamorphosed terrestrial basaltic rocks (sometimes called greenstones) contain green minerals (such as chlorite, actinolite, epidote and serpentine), and these are the specimens most commonly mistaken by amateur collectors as Martian meteorites. 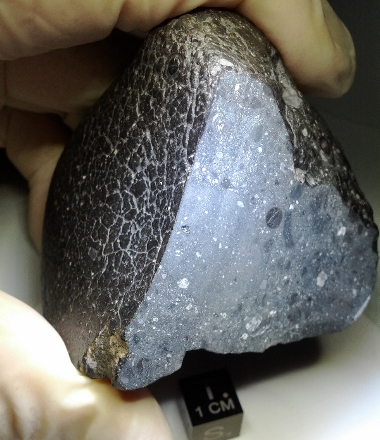 Without detailed testing, one way to recognize a possible Martian meteorite is to look for obvious fusion crust, which is a thin, black, glassy coating formed on the exterior of all meteorites containing iron-bearing silicate minerals as they plummet and decelerate through Earth's atmosphere. 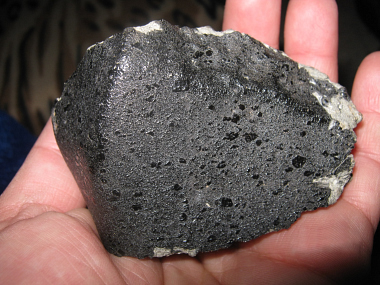 Unfortunately most recently fallen stony meteorites of all types have black fusion crusts, but if the meteorite has resided on Earth for a long time any crust may have been removed by weathering or wind-ablation. Another test that is commonly done involves magnets; however, this has proven to be a major problem for scientists interested in measuring the magnetic properties of Mars. Martian meteorites are slightly magnetic, but much less so than meteorites containing iron metal. A protocol has been established for all Antarctic meteorites that NO magnets are ever used near them. Unfortunately, nomads, dealers and private collectors elsewhere frequently put very strong rare earth magnets on all meteorites, which remagnetizes the outer portions of the specimens instantly. If you want to test the magnetic properties of a possible Martian or any other meteorite, please pry off a small crumb and test that with a magnet instead of compromising the entire specimen. This problem has necessitated core drilling or cutting of some meteorites for magnetic studies in order to avoid the effects imposed by these practices. Shock during ejection of specimens from Mars (or even by impacts prior to that) has produced some distinctive macroscopic features in many Martian meteorites. The most prevalent varieties (shergottites) all contain a diaplectic glassy form of plagioclase feldspar called maskelynite. In fact, the type specimen for this mineral or mineraloid (first described by Gustav Tschermak in 1872) is the Shergotty meteorite! 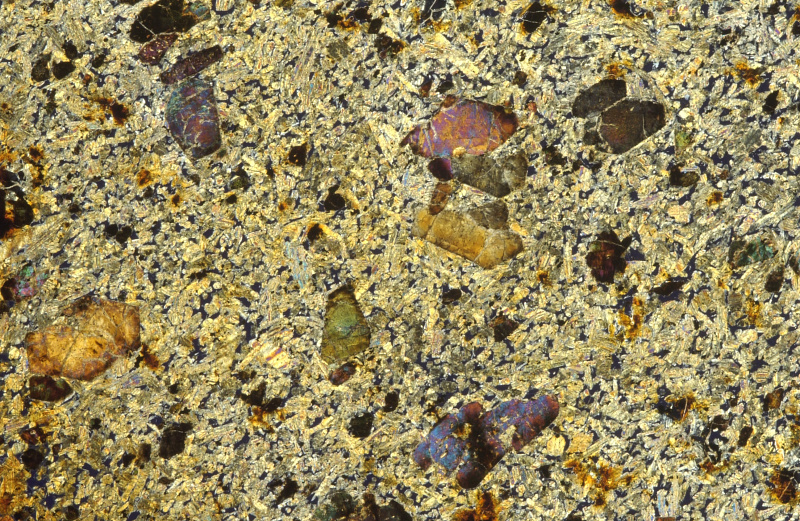 Maskelynite is readily recognizable by its brilliant adamantine sparkle on broken surfaces examined in sunlight, and it is isotropic (black) in cross-polarized light. 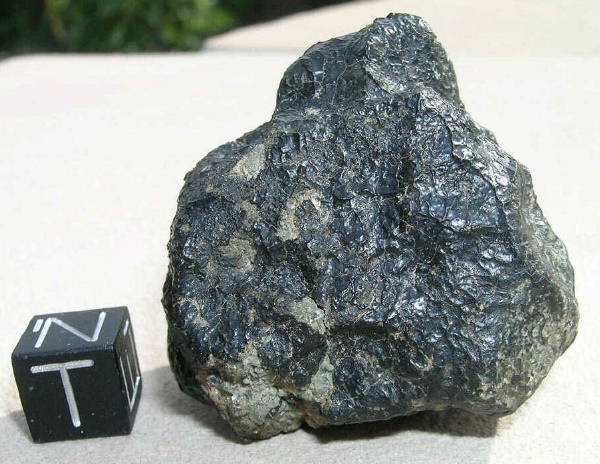 Although maskelynite is found also in some lunar and eucrite meteorites, it is most diagnostic of Martian meteorites (except nakhlites and "baby" shergottite NWA 4480, which evidently experienced less shock). 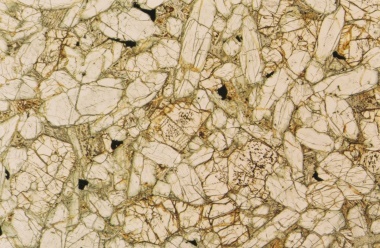 Even greater shock pressures and temperatures have caused complete melting of plagioclase in some shergottites (e.g., Allan Hills 77005, Dhofar 378, Northwest Africa 5298, Northwest Africa 6342), resulting in a distinctive "microspherulitic" texture of quenched, anisotropic plagioclase blades or even the formation of complex, vesicular feldspar-rich glass. Other common effects of shock are the presence of small interior pockets of black glass (sometimes vesicular) and/or cross-cutting thin veinlets of black glass. This evidently was injected in a molten state into the rocks as they were spalled off Mars and contains trapped Martian atmospheric gases. Confirmation of the Martian origin of a meteorite requires microscopic examination and special chemical analyses. The most common mineral constituents are pyroxenes (pigeonite, augite and less commonly orthopyroxene), olivine, plagioclase feldspar (usually now maskelynite), oxides (titanomagnetite, ilmenite, chromite, baddeleyite), calcium phosphates (merrillite, apatite), silica polymorphs (commonly exhibiting post-shock changes) and iron sulfide (pyrrhotite). The chemical compositions of all these minerals have specific known ranges, and in particular the ratios of iron to manganese (Fe/Mn) in pyroxenes and olivines are very characteristic, especially when considered in combination with the plagioclase compositions (see plot above). Usually a specimen can be recognized as Martian very readily once a transparent thin section is made, or within a matter of minutes of examination of a polished surface utilizing an electron microprobe. Of course, oxygen isotope data would serve as further confirmation, but that is not necessary (and the isotopic values for Martian meteorites are by themselves non-unique). The major minerals (pyroxenes, olivine and plagioclase) in Martian meteorites show systematic compositional variations, depending on the bulk composition of each rock and the degree to which it underwent fractional crystallization during cooling and progressive solidification. Plagioclase compositions range from more sodic (i.e., lower in end-member component anorthite An) in nakhlites (An14-37, but mostly near An30) to typically much more calcic in shergottites (An33-74, but about half of that range in any given specimen). Pyroxenes in nakhlites are predominantly calcic (augite), whereas pyroxenes in shergottites are predominantly subcalcic (orthopyroxene and pigeonite), with augite present in most specimens as well. In a standard quadrilateral plot of the major end-member components (enstatite En, ferrosilite Fs, and wollastonite Wo), different specimens have differing patterns of compositional variation. 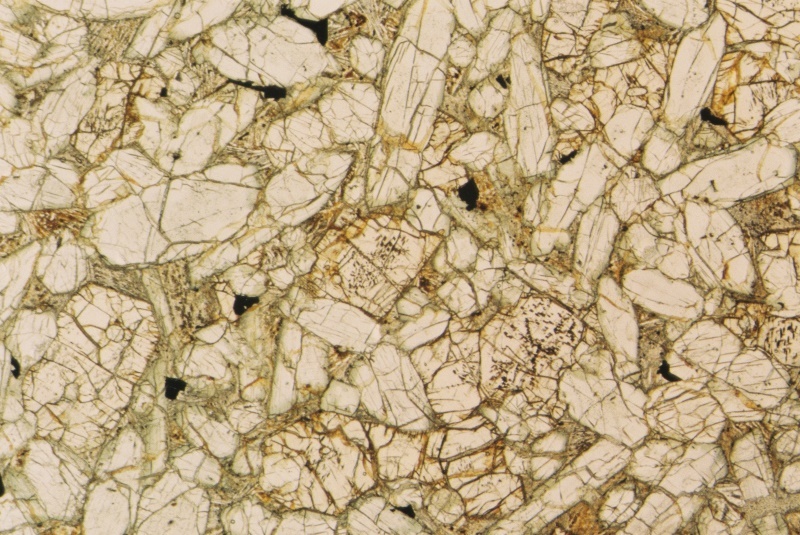 One aspect of shergottites which is not evident from such plots is that wide variations in composition commonly occur within individual pyroxene grains. Such "chaotic" compositional zoning may reflect disequilibrium processes operative during solidification of shergottite magmas. Olivine in the more primitive shergottites typically also exhibits compositional zoning; however, there is evidence that some of this zoning has been differentially erased by diffusion in the more slowly cooled shergottites. 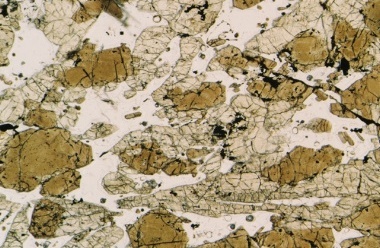 Olivine in nakhlites and chassignites shows a narrower compositional range in keeping with the inferred formation of these rocks as igneous cumulates. How are they classified? Why just one breccia specimen? What about sedimentary rocks? 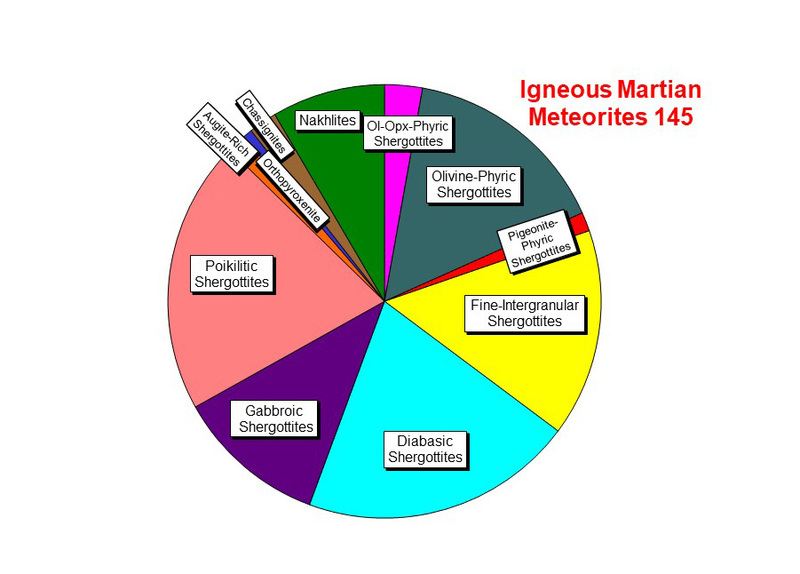 Of the 133 known Martian meteorites, all but one are igneous rocks. Only one specimen (Northwest Africa 7034 and paired stones from Rabt Sbayta) is an impact-produced breccia (despite the fact that much of Mars is covered with impact craters). Among the igneous specimens, several ultramafic examples exhibit cataclastic structures and shock veining, but they are not fragmental breccias like those from the Moon or howardites. And so far no sedimentary rocks like those examined in the small area of the Meridiani Planum site have been recognized. The pie chart below sorts the 111 known igneous specimens on the basis of petrological categories based only on rock textures. A long-standing problem in studying natural things is what names to give them. Nomenclature tends to be a human endeavor that changes over time, as new understanding emerges. Ideally, scientific nomenclature should be entirely descriptive with no hint of interpretation, but in practice this is difficult to achieve. Scientists also have their own favorites, and tend to want to retain some of the history of thinking on any subject in the form of the names used. In the case of Martian meteorites, three of the famous falls gave rise to the categories shergottites, nakhlites and chassignites (the last of which had only one member until the recovery of Northwest Africa 2737 in 2000 and Northwest Africa 8694 in 2014). Then in 1984 the Allan Hills 84001 meteorite was found (and eventually recognized to be Martian in 1994). This rock is composed mainly of orthopyroxene (with tiny carbonate-rich regions), and it came to be called an orthopyroxenite (which is a name applied to similar terrestrial rocks). If we used terrestrial rock names, the shergottites might be called pigeonite basalts (although they are not strictly basalts like those on Earth), the nakhlites would be called olivine clinopyroxenites, and the chassignites would be called dunites. Things got more confusing with the unfortunate introduction (and continued usage) of the name “lherzolitic” shergottite for a subset of maskelynite-bearing Martian rocks (including the very first one found in Antarctica). The problem is that the term lherzolite is applied to much coarser grained terrestrial rocks rich in olivine and pyroxenes (i.e., ultramafic rocks called peridotites) that contain both orthopyroxene and clinopyroxene as major constituents. All but a few of the rocks that have been called “lherzolitic” shergottites definitely are ultramafic (with very little maskelynite), but they are relatively fine grained and contain no or up to 3 volume percent orthopyroxene. This mistake may have been caused by confusion about the relevance of the low Ca content in the major type of pyroxene (pigeonite), which approaches the very low Ca contents in true orthopyroxene; nevertheless, pigeonite is a clinopyroxene. The shergottites formerly dubbed "lherzolitic" all have poikilitic textures (which means that they contain some much larger grains that enclose lots of smaller grains of other minerals), but several of these specimens (such as Northwest Africa 1950, Northwest Africa 2646, Roberts Massif 04261/04262, Northwest Africa 4468 and Northwest Africa 10169) also contain more than 10 volume% plagioclase, so they are not even ultramafic (like true lherzolites). For these and other reasons Erin Walton, Anthony Irving, Theodore Bunch and Christopher Herd recommended in 2012 that usage of the term "lherzolitic" be discontinued for all shergottites in favor of the textural term poikilitic. At least eight other shergottites (Shergotty, QUE 94201, Los Angeles, NWA 480/1460, NWA 2800, NWA 5029, JaH 479, NWA 5990) are sufficiently coarse grained to be called diabasic shergottites, and at least two specimens (NWA 7032/7272 and NWA 7320) are even coarser grained gabbroic shergottites. 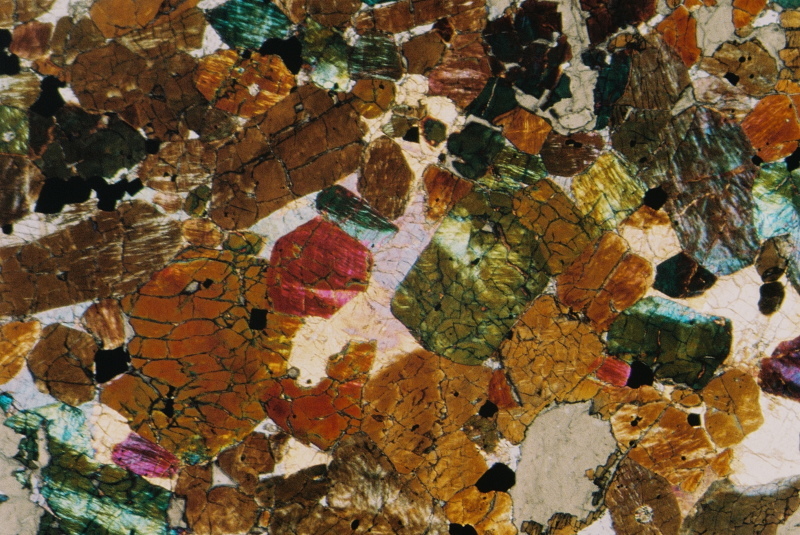 Optical thin section images in plane polarized light of ultramafic shergottite NWA 4797 (left) and diabasic shergottite NWA 1460 (right). Note the shock injection melt vein cutting NWA 4797. Optical thin section images of olivine-orthopyroxene-phyric shergottite NWA 1195 (left, cross-polarized light) and diabasic shergottite NWA 5990 (right, plane polarized light). Note that the plagioclase (maskelynite) in NWA 1195 is isotropic (black), and the shocked olivine in NWA 5990 is distinctly brown. 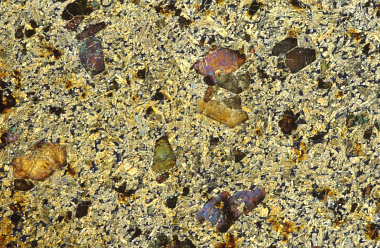 Optical thin section images of nakhlite Yamato 000593 (left, plane polarized light) and chassignite NWA 2737 (right, cross-polarized light). The major minerals in the nakhlite are prismatic augite, equant olivine and magnetite (black), and the plagioclase (white) in NWA 2737 is not isotropic (i.e., less shocked than in most shergottites). Shergotty, Zagami and similar olivine-free specimens commonly have been called basaltic shergottites, but a better term would be mafic shergottites (or perhaps pigeonite-plagioclase shergottites). 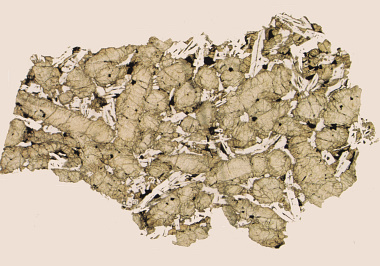 With the subsequent discovery of olivine-bearing shergottites, such as Elephant Moraine 79001, Dar al Gani 476, Sayh al Uhaymir 005 and Northwest Africa 1068, the term olivine-phyric shergottite has come into wide usage. This term refers to the fact that the olivine grains are relatively large and easily visible (like in porphyritic terrestrial basaltic lavas); it is preferable to the term picritic, which was used initially for Northwest Africa 1068. A variant of this term, olivine-orthopyroxene-phyric shergottite, has been applied to Northwest Africa 1195 and several other specimens in recognition that both olivine and orthopyroxene are present as early-formed crystals (or phenocrysts). The large crystals in Northwest Africa 1195 show a preferred orientation of their longest dimensions, which probably is indicative of magmatic flow within a subsurface conduit (and explains the unusual elongated shape of the NWA 1195 stone). These petrological names are for the most part descriptive, but they do not convey the bulk chemical composition of these rocks and by inference that of the magmatic liquid from which they crystallized. In the case of terrestrial igneous rocks, it has long been known that batches of magma underground can change their composition by progressive crystallization of solid minerals in a particular sequence as temperatures fall. This process is called fractional crystallization (and is somewhat analogous to distillation), and it almost certainly affected subsurface batches of magma on Mars as well. The adjectives more primitive and more evolved are used on both planets to designate, respectively, magmatic rocks that have undergone less of this process (e.g., the olivine-orthopyroxene-phyric shergottites) or more of it (resulting in loss of olivine and orthopyroxene by crystal settling or plating out on reservoir walls). 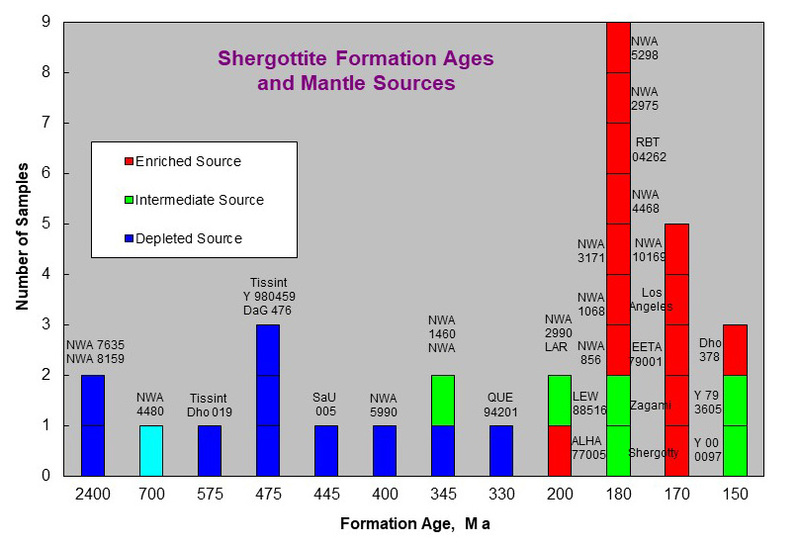 Ironically, the first two shergottites known (Shergotty and Zagami) are moderately evolved magmas, and there are others that are even more evolved (Dhofar 378, Northwest Africa 5298, Los Angeles, Northwest Africa 2800 and Ksar Ghilane 002). An important corollary of this spread of bulk compositions is that if we had only Shergotty (or even worse Los Angeles or NWA 2800) as samples from Mars, and we thought that they represented magmatic liquids derived directly from the Martian mantle, we would make serious errors in our estimates of the composition of the Martian interior - we would conclude that it is much more iron-rich than it evidently is. 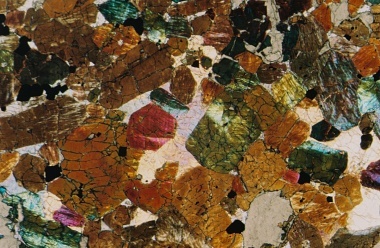 Optical thin section image in cross-polarized light of Yamato 980459 (left) and macroscopic view of a fragment of Northwest Africa 5789 (right). 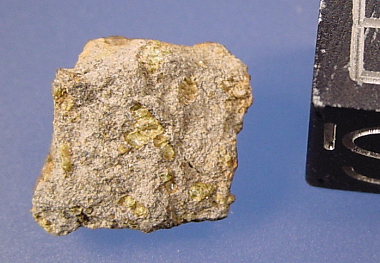 Both specimens are primitive, permafic olivine-phyric shergottites, and almost identical in bulk chemical composition. The most primitive shergottites discovered so far are Yamato 980459/980497 and Northwest Africa 5789. 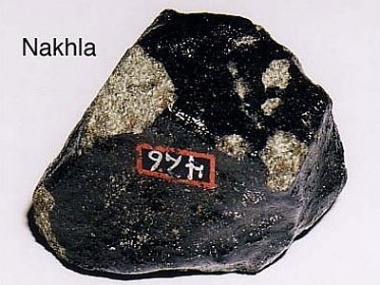 Yamato 980459 is an unusual olivine-phyric volcanic or shallow intrusive rock that does not contain any plagioclase (or maskelynite) – but it probably would have, if it had not crystallized so rapidly to form its distinctive quenched groundmass. Northwest Africa 5789 is another olivine-phyric shergottite containing only a few volume percent plagioclase, so it actually is almost an ultramafic rock (yet very different from Allan Hills 77005 and related poikilitic rocks). These specimens contain very magnesian olivine (with Mg/(Mg+Fe) of 0.85-0.86), implying that they crystallized from mantle-derived magmas which rose so rapidly to the surface that essentially no fractional crystallization took place. We can make a very important inference from these specimens about the Martian mantle: it must be composed mainly of olivine and low-Ca pyroxene and must have a magnesium to iron ratio very similar to that of the Earth's mantle (although the abundances of both magnesium and iron must be higher in the Martian mantle). Since the relatively small numbers of Martian meteorites are delivered somewhat randomly to Earth, and their discovery and recognition is even more variable, it should not be surprising that the first specimens found (or even the most abundant ones) belonging to a particular subgroup may not necessarily be representative of the range of rock types in outcrops or subsurface formations on Mars. Since 1989 terrestrial volcanic (and even some shallow intrusive rocks) have been classified on the basis of their bulk chemical compositions rather than their mineralogical characteristics. This became necessary for several reasons: (1) numerous traditional names were confusing (in some cases different regional names were given to essentially the same type of rock), and (2) more rapidly cooled rocks commonly contain variable (but in some cases abundant) amounts of glass or very fine grained mesostasis, which is impossible or difficult to characterize mineralogically. On Earth, rocks such as basalt, andesite, phonolite, etc. have well-defined ranges of bulk chemical composition, even though they also have distinctive mineralogies. The same type of approach now may be necessary for the burgeoning collection of Martian igneous rocks that we have in the form of meteorites, and a proposed scheme is illustrated below. The boundaries separating the mafic, permafic and ultramafic categories are drawn somewhat arbitrarily, but fall within logical gaps in the current data array. Within this framework of major element classes, it also is possible to designate textural type and the trace element/radiogenic isotopic characteristics that discriminate among the three different mantle source types (see below). Two olivine-phyric shergottites (NWA 6162 and Tissint) have been called permafic in the matrix chart above, even though at least one of these specimens plots in the ultramafic field. The reason is that these two specimens contain an apparent excess of large olivine crystals which evidently accumulated into the magmas before they ascended towards the surface of Mars. In fact, most of the olivine-phyric shergottites (except Yamato 980459, NWA 5789, and NWA 2990 and paired stones) contain differing amounts of excess olivine crystals, and thus their bulk compositions do not represent those of just the magmatic liquids (and they really should plot further to the left on the chart of Mg/(Mg+Fe) versus CaO). Scientists can decipher this anomaly because the compositions of the cores of the large olivine crystals in these shergottites are too magnesian to have been in equilibrium with the measured bulk compositions. 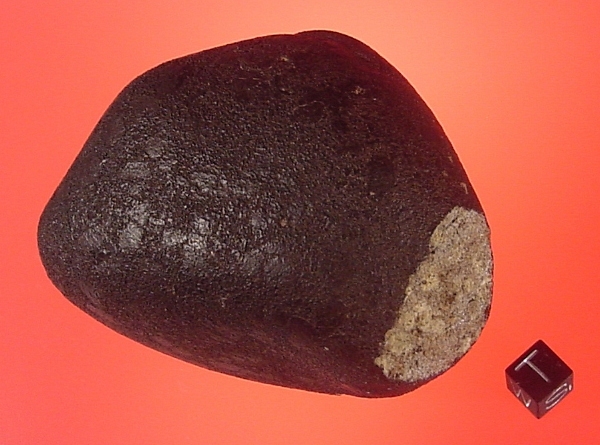 The concept that early-formed olivine crystals might tend to accumulate into other batches of mafic magma in subsurface reservoirs is supported by well-documented examples of terrestrial basaltic lava flows containing such excess olivine crystals, notably the 1868 picritic basalt lava flow from Mauna Loa volcano in Hawaii. 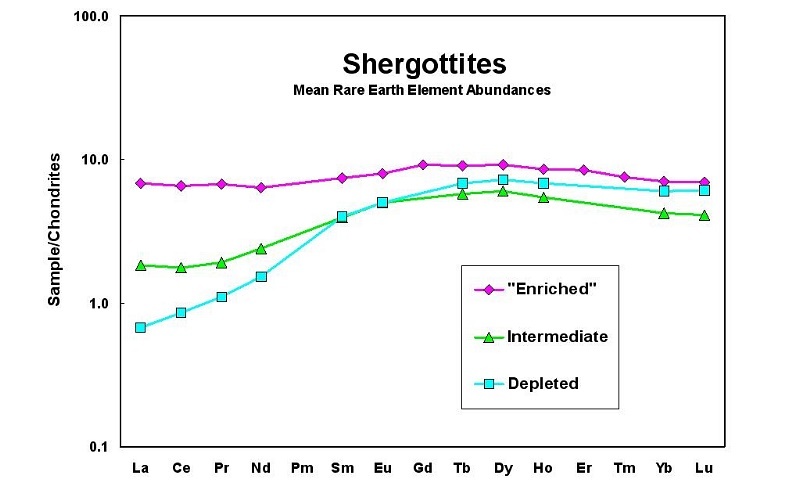 A remarkable observation about the 117 known shergottites is that (with one exception) their trace element characteristics (at least for the 80 specimens analyzed so far) define three different major groups, termed depleted, intermediate and "enriched". The exception is unshocked shergottite Northwest Africa 4480, which has been shown to have characteristics between those for the intermediate and depleted groups. These same separate groupings are mirrored in their radiogenic isotopic compositions (see below). Within each of these major groups there is some variation, especially for those elements that are affected by fractional crystallization. However, for the group of 15 rare earth elements the abundances relative to those of chondrites are quite distinct in their patterns (see figure below). Because these patterns are controlled predominantly by the chemical composition and mineralogy of their mantle source regions, it can be concluded that there may be three major separate and different types of mantle domains within Mars from which shergottites were produced by partial melting (and which never convectively mixed with each other). Why are Martian meteorites important? Where on Mars do they come from? Despite the stunning success of the six landed spacecraft on Mars, the only actual Martian samples available for study on Earth are the Martian meteorites. Scientists can conduct many more specialized analyses on rock samples in terrestrial laboratories than it is possible to do with remote robotic craft. For example, the exact mineralogy, mineral chemistry and formation age of a rock on Mars cannot be determined remotely. Still, the various rovers have provided invaluable in situ morphological and chemical data about surface outcrops on Mars which are not possible to obtain in other ways. Perhaps the most remarkable finding is that the rocks at the landing sites are quite different from the Martian meteorites. Based on studies by Jutta Zipfel and colleagues of spectral data collected by the Opportunity rover, only one rock ("Bounce" at Meridiani Planum) might be compositionally similar to some olivine-free shergottites. The rocks at the Pathfinder and Spirit sites do appear to be fine grained to porphyritic lavas somewhat like the shergottites, but they are different in detail. Many of them have been pervasively modified from their original igneous state by hydrothermal alteration or weathering processes, evidence of which we see fairly clearly (but much less extensively) only in one group of Martian meteorites, the nakhlites. Reasonable estimates of the ages of rocks at the landing sites (based on impact crater densities determined from orbit) are in the range 3-4 billion years, which is much older than the ages determined for all but one of the Martian meteorites found so far. Broad constraints on some aspects of the chemical compositions of planetary surface materials can be obtained utilizing various types of spectrometers on orbiting spacecraft. Unfortunately, such data have limited spatial resolution (often no better than several hundred kilometers), and can only “see” the upper few millimeters of near-surface material. 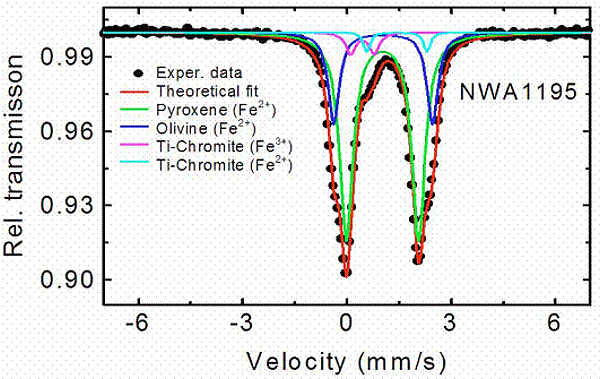 Mixing of materials by repeated impacts coupled with secondary coatings by weathering products and wind-blown dust significantly limit the relevance of these techniques in the case of Mars. Even for the Moon, where hydrous alteration is absent, orbital chemical maps do not give much specific information about the sources of the at least 140 known lunar meteorites (see Randy Korotev's excellent website). 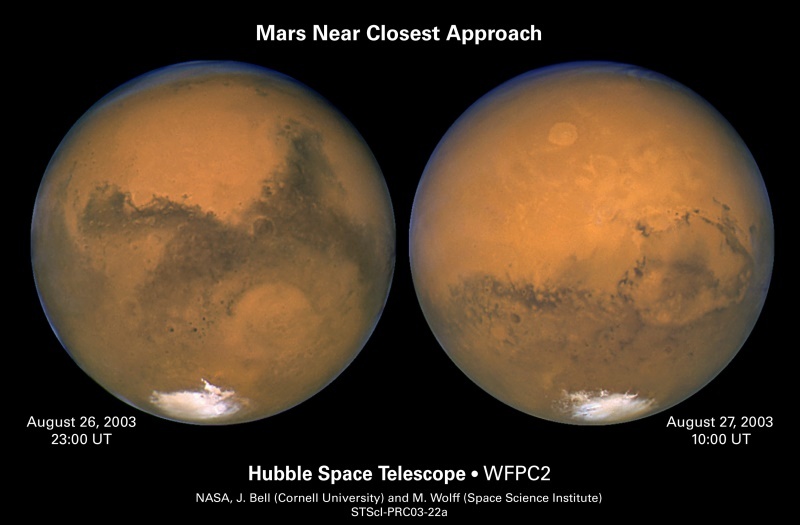 Harry McSween, Jeffrey Taylor and Michael Wyatt have assessed data obtained from the Mars Reconnaissance Orbiter and have made comparisons with robotic rock analyses from the Pathfinder and MER landing sites and bulk compositions of Martian meteorites (see here). The clear differences among these various measurements probably mean that the remote measurements (and especially those from orbit) are compromised by secondary processes that obscure the primary rock compositions. 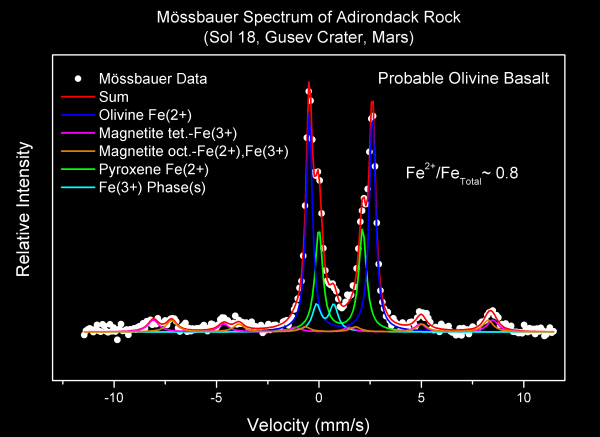 Nevertheless, one very significant finding from analyses of the freshest rocks at Gusev crater by the Spirit rover is that their bulk FeO/MnO ratios (44-48 for Adirondack, Humphrey and Mazatzal) are very similar to those for olivine-phyric shergottites (32-45), especially if differences in mafic mineralogy are taken into account. 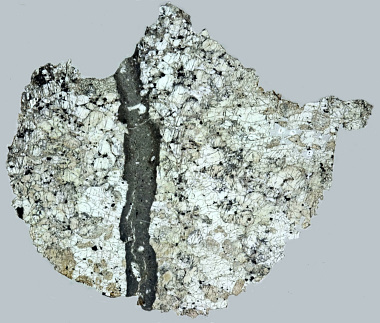 The Mössbauer spectrometer on the Spirit rover was able to determine quite accurately the proportions of iron-bearing minerals in mechanically-abraded igneous rocks such as Adirondack (see below), and this spectrum can be compared with one collected in a terrestrial laboratory on a thin wafer of Northwest Africa 1195. These two rocks clearly contain similar major and minor minerals, but the proportions of olivine and pyroxene are opposite: the meteorite (which is one of the most primitive and most olivine-rich shergottites) actually has less olivine than Adirondack. This must mean that the bulk composition of Adirondack is quite different from that of any of the shergottites. Viewed another way, this means that we might expect to find other different types of Martian igneous rocks as meteorites (let alone possible rare sedimentary rocks). Notice also that the Mössbauer spectra confirm that both rocks contain ferric iron, but cannot tell us anything about minerals such as feldspars or silica (which contain only trace amounts of iron). It is difficult to be sure where on Mars the 133 Martian meteorites come from. First, unlike the situation with lunar meteorites, they probably do not come from 133 different sites, but instead more like 20 separate sites. This is because more of the Martian meteorites probably are launch paired; that is, they probably are pieces from different parts of single lava flows or subsurface intrusions that are slightly different from each other (due to natural heterogeneity in mineralogy and texture), but which nevertheless are genetically related. We suspect this because of clustering of cosmic ray exposure ages, which probably means that a collection of disaggregated (but not necessarily originally adjacent) fragments were ejected from certain target sites on Mars and traveled to Earth together. A fascinating implication from this is that launch paired pieces need not land in the same country (or even on the same continent) on Earth. Based on measurements of cosmogenic isotopes by Kunihiko Nishiizumi and colleagues, one such group of specimens may include Dar al Gani 476, Sayh al Uhaymir 005, NWA 1195, NWA 2046, NWA 2626, NWA 4222, NWA 4527/4925, Yamato 980459, NWA 5789, NWA 6162, Tissint, Larkman Nunatak 12095, NWA 7635 and NWA 8159 which although differing from specimen to specimen in detailed mineralogy and in formation age, could all be samples from the same depleted hypabyssal igneous complex, but from different depths in a sequence of rocks that experienced differing cooling rates of their parent magmas. An analogy to consider would be a single impact into the pile of basaltic lava flows of the Columbia Plateau of eastern Washington State, USA. The random ejecta could include fragments ranging in age from 16 to 6 million years, with varying igneous textures, different bulk compositions, and indeed a wide range in trace element/isotopic characteristics. The uncertainties about source craters do not stop people from speculating about launch sites, however. The unique (so far) specimen Allan Hills 84001 has such an ancient formation age that most scientists consider that it came from somewhere in the ancient cratered terrain in the southern hemisphere of Mars. One scientist has speculated based on imperfect spectral arguments that the ten nakhlites and three chassignites (which share many common characteristics) may come from the Syrtis Major region, but overall none of the Martian meteorites is a good spectral match for anywhere on Mars. 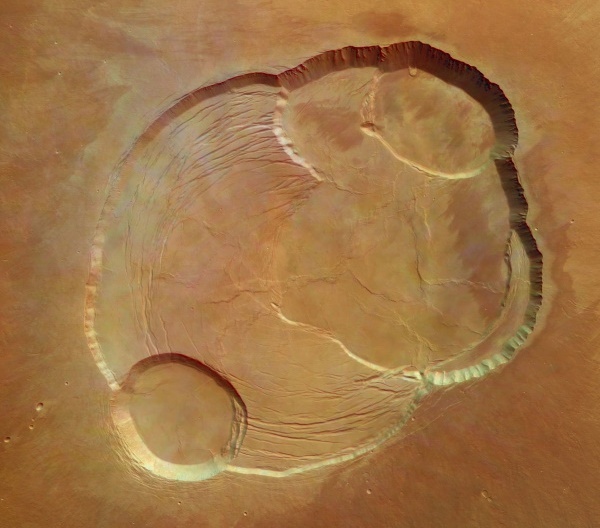 More likely sources for shergottites are the relatively young volcanic regions of Tharsis (especially Olympus Mons – see below) and Elysium Mons, but until we actually obtain samples from those places this must remain conjectural. If we take a cue from the lunar meteorites, then we should not be surprised that the Martian meteorites have few (if any) counterparts at the Mars landing sites. After all, if our only knowledge of the Moon was from lunar meteorites, we would not know much at all about the high-titanium mare basalts that are widespread at both the Apollo 11 and 17 sites. Mons taken by Mars Express. Note how few impact craters are present. Let's go and land there (and bring a rock back)! 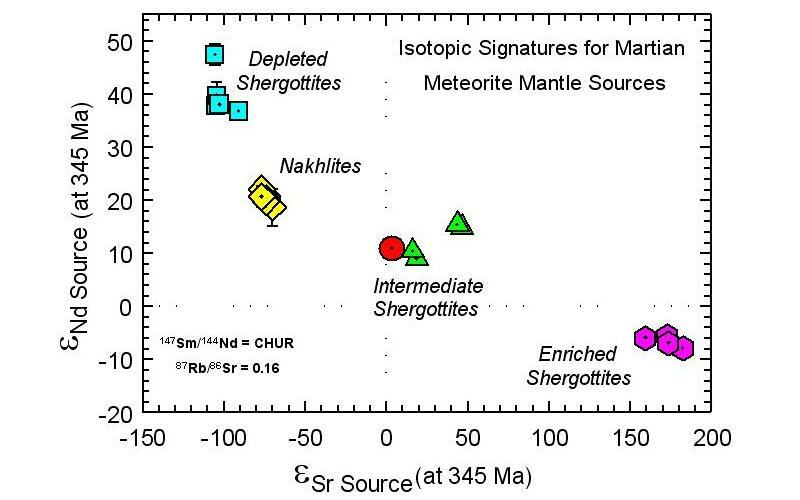 The minority view championed by one research group is that all the ages of shergottites were reset by shock events and/or hydrothermal alteration on Mars prior to meteorite ejection, and that their true crystallization ages are around 4.1-4.3 Ga. This conclusion is based on a particular interpretation of whole rock Pb-Pb isotopic data for shergottites. Most scientists reject this claim because there is no evidence of sufficient pre-ejection shock or hydrothermal alteration in the meteorite specimens, and because there are plausible alternative explanations for the Pb-Pb isotopic arrays as mixing lines involving terrestrial or (more likely) Martian crustal contaminants. The dominant view of the crystallization ages of dated shergottites is shown in a plot above, which also highlights the remarkable discovery that the different shergottites must be magmas formed by melting of just three distinct types of mantle geochemical reservoirs (depleted, intermediate and enriched). 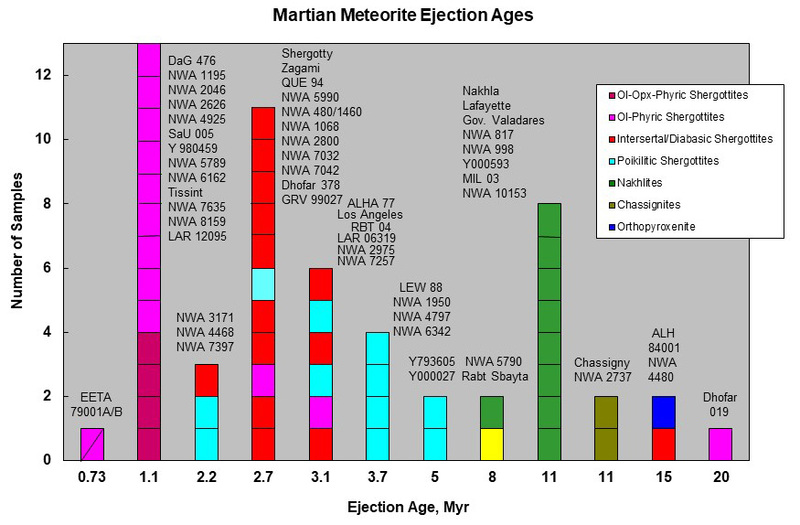 The range of ejection ages for all Martian meteorites is shown in a second plot, and a third plot (below) shows both types of ages together. In addition, the terrestrial residence times for some Martian meteorites (as long as they are less than about 40,000 years) can be measured from the content of radioactive carbon-14 produced by cosmic ray interaction with oxygen atoms while the meteoroid was in space. For longer residence times, different cosmogenic isotopes are measured to obtain such estimates. These terrestrial ages range from essentially zero for falls (and Northwest Africa 1460) up to about 450,000 years (for Northwest Africa 4925). Mafic to ultramafic igneous rocks produced by partial melting of planetary mantles inherit isotopic characteristics from their deep source regions, and also can acquire secondary isotopic characteristics by reaction with mantle metasomatic fluids and/or by assimilation of crustal rocks during ascent. 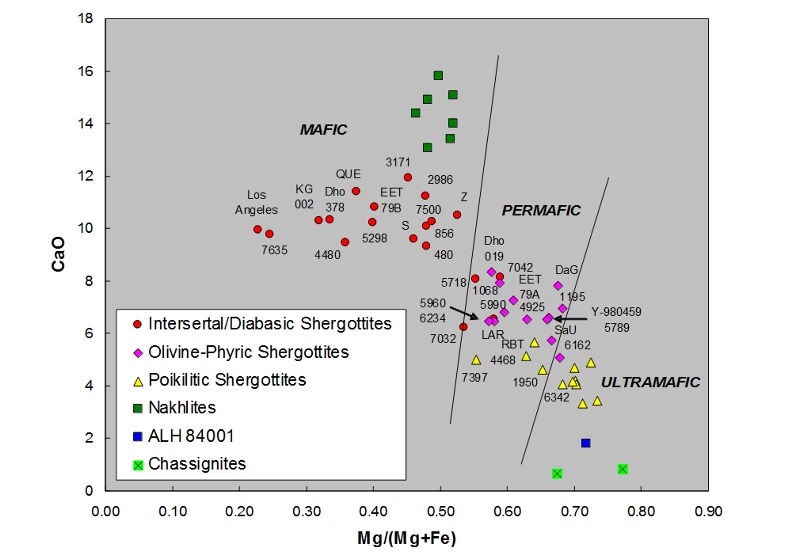 The neodymium and strontium isotopic parameters for shergottites and nakhlites exhibit a remarkable grouping into just four different and widely separated categories (see plot below). Are these groups a reflection of four different mantle source characteristics, or do they represent in part an overprint of subsequent isotopic components related to metasomatism and/or assimilation? A somewhat similar pattern observed for terrestrial basalts has been interpreted as signifying the variable operation of all these processes, but do similar processes occur also in Mars? For Earth, the metasomatic and assimilation processes almost certainly involve fluids rich in water, but for Mars it may very well be that similar processes (if they have operated at all) were mediated by fluids rich in halogens instead. Studies of terrestrial basaltic and mantle rocks have led to a consensus that the Earth's mantle crystallized from an ancient magma ocean generated as a consequence of formation of the metallic core. Although Mars is a much smaller planet (possessing only 38% of the gravity of Earth), it too apparently has a metal and/or iron sulfide-rich core, and it almost certainly had an ancient magma ocean. Yet the smaller size of Mars and consequent more rapid heat loss probably led to a much shorter duration of convective mixing than for Earth – so much shorter that different chemical reservoirs may have remained isolated from each other for a very long time, even until 1.3 billion years ago (when the nakhlite and chassignite parent magmas were generated by partial melting). One interesting chemical characteristic of Martian meteorites provides strong support for this deduction. An isotope of tungsten (182-W) is a product of radioactive decay of an isotope of hafnium (182-Hf), but the half life is so short (8.9 million years) that all of the primordial 182-Hf has long since decayed away. The daughter isotope 182-W should not be detectable in mantles that have undergone continued convective mixing for several billion years. Yet, 182-W is present in shergottites and nakhlites! The most logical explanation is that these relatively young (1300-150 million year old) igneous rocks inherited their 182-W from mantle reservoirs which had remained separate from other parts of the Martian mantle since very early in the interior differentiation history of the planet. In other words, the Martian magma ocean was relatively short-lived in comparison with magma oceans in larger planets like Earth and Venus. All Martian meteorites have been shocked to varying extents. They experienced shock upon ejection from Mars, and some may have experienced shock from impacts onto the surface of Mars before that. For discussion of these topics, please consult Bevan French's wonderful treatise “Traces of Catastrophe”, Jeffrey Taylor's excellent article on shock and heating in asteroids, and articles by Erin Walton and Christopher Herd on specific analysis of shock features in shergottites. The peak shock pressures and temperatures can be estimated from mineralogical criteria calibrated by experimental studies, and range from about 25 GPa for nakhlites to 60-80 GPa and up to 2000°C for some shergottites (e.g., Allan Hills 77005, Northwest Africa 4797, Northwest Africa 6342). Of special importance in this field of inquiry are phases such as maskelynite, “post-stishovite” (after shocked silica), various types of melt glasses, injection veins, and even vapor bubbles and vugs. 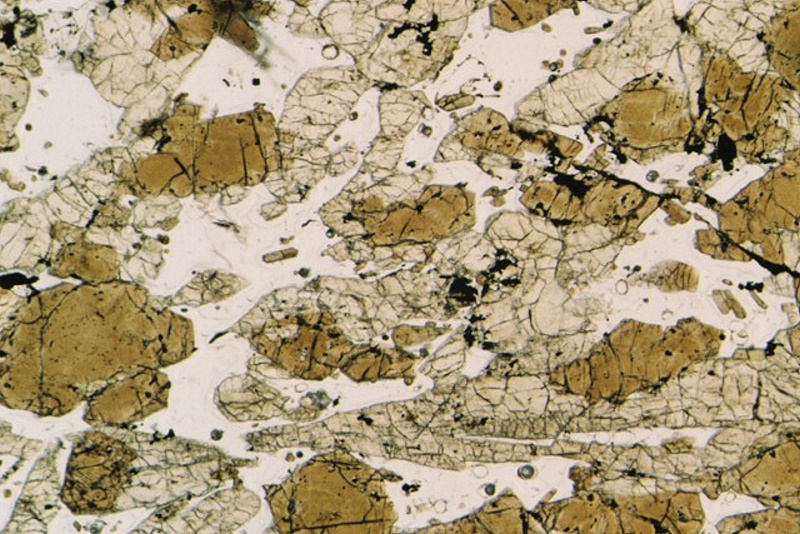 The black or dark brown color of olivine in some Martian meteorites (notably chassignite Northwest Africa 2737, shergottite Northwest Africa 1195 and shergottite Northwest Africa 5990) is now understood to be caused by shock-induced, solid-state precipitation of nanometer-sized particles of metallic iron. The Allan Hills 84001 meteorite caused a sensation because of claims made in 1996 by David McKay and coworkers that it contained a preponderance of proposed evidentiary markers for life on Mars about 3.6 Ga ago. Over a decade later this evidence has nearly all been refuted, although not everything in this remarkable meteorite has been fully explained. For a discussion of these issues, see Allan Treiman's thorough summary. One intriguing aspect that has resisted full explanation is the morphology of tiny magnetite grains, which resemble those produced by magnetotactic bacteria on Earth; however, similarly shaped crystals do not necessarily imply a similar mechanism of origin. Lost in the rancor is the fact that the carbonates within Allan Hills 84001 almost certainly signify that liquid water was present on and within Mars 3.6 Ga ago, at a time when the first known microbial life was active on Earth (based upon the fossilized stromatolite mats of that age from Western Australia). It has been said by some that even if the Allan Hills 84001 meteorite does not really contain bona fide evidence for ancient life on Mars, it has served to promote public, political and research interest in Mars. While that may be so, it is troubling to many scientists that such interest was engendered for less than the right reasons. Still other scientists would say that the debate generated by the original claims was healthy, and showed the process of scientific inquiry in action. Perhaps the discussion about the true formation ages of shergottites mentioned above is another such issue, although one that understandably does not carry with it the special fervor associated with the search for evidence of past or current extraterrestrial biology. A wish list of Martian meteorites! Is 150 specimens the next plateau by 20??. This site was created by and is managed by Dr. Tony Irving of the University of Washington.